Johns Hopkins Medicine’s senior vice president of Marketing and Communications, Dalal Haldeman, notes that innovations and discoveries are what we do best at Johns Hopkins. Clinicians, staff and students are developing mobile apps and digital technologies that are transforming both communication and how people and organizations go about their work and lives. From unprecedented patient empowerment to the ability to educate entire populations about health, this new area is one of limitless possibilities. The Solutions team has for more than a decade offered one of the most highly regarded and widely used clinical decision support tools—the ABX POC-IT Guide—and the more recently developed Osler Medicine Survival Guide. 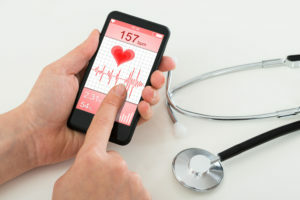 Now, Johns Hopkins is collaborating with Apple on an app designed to empower heart attack patients in their recovery. Nationwide, one in five cardiac patients is readmitted to the hospital within 30 days, says Francoise Marvel, a third-year internal medical resident and soon-to-be chief resident. “They leave without the guidance, information and skill-building they need to get a healthy start,” she says. The app, called Corrie (“Cor” is Latin for heart), works with Apple Watch and would be the first cardiology app in CareKit, Apple’s new framework for medical applications. Corrie monitors a patient’s heartbeat, blood pressure and exercise, creating a record for patients and their doctors. It also alerts users when it’s time to take medications, and it pings if they have been sitting a long time and would benefit from a walk. Through Corrie, users can also schedule follow-up appointments and learn about heart health through animated videos. “It’s like a digital health buddy to keep patients on track,” says Marvel. She began developing the app in 2014 with support from Johns Hopkins Technology Ventures and grants. The project gained momentum in 2016, when Marvel teamed with preventive cardiologist and mobile health expert Seth Martin, and with Whiting School of Engineering students Matthias Lee and Gavi Rawson. For a pilot study, Apple donated 200 Corrie-equipped smartwatches to The Johns Hopkins Hospital and Johns Hopkins Bayview Medical Center. Cardiac patients at those hospitals now receive the watches the day after they are admitted and keep them for 30 days after discharge. If the pilot shows Corrie can help those patients improve their health and prevent readmissions, the app could be available to cardiac patients at other hospitals within the next year.